Pietas Austriaca is a path-breaking study of the relationship between religious beliefs and practices and Habsburg political culture from the end of the medieval period to the early twentieth century. In this seminal work, Anna Coreth examines the ways that Catholic beliefs in the power of the Eucharist, the cross, the Virgin Mary, and saints were crucial for the Habsburg ruling dynasties in Austria and Spain.Coreth analyzes how leading Habsburg rulers in the early modern period used Catholic sacraments, rituals, and symbols to create a sense of identity and political purpose for their far-flung possessions in Europe. She also demonstrates how this Catholic culture drew on earlier models of pious Catholic rulers, especially on the memory of Rudolph. In addition, Pietas Austriaca discusses the importance of this particular brand of Catholic piety in the confrontation with Protestantism in the Counterreformation period and in the encounter with the Muslim Turkish empire. Coreth extends her study to discuss the myriad ways that this religious culture continued to influence Austrian society in the nineteenth and twentieth centuries. 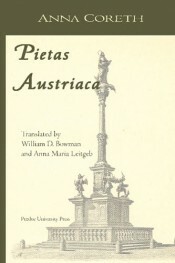 Pietas Austriaca is a tour de force that combines expertly social, cultural, gender and intellectual analysis of the political and religious landscape of one of Europe's most important empires and leading dynastic houses. Anna Coreth studied history at the University of Vienna. She was as an archivist and Austrian historian.